LG BH9530TW 9.1Ch 3D Sound Blu-ray Home Cinema System from Amazon UK for £579.99 only and save £67.94. 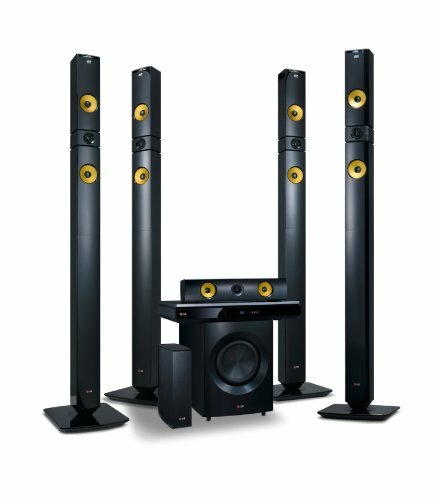 Powerful 1460w Home Cinema System with Rear Wireless Speaker – Sound with convenience and style is here with Wireless Rear Speaker. Enjoy clean, elegant look in your living room with easy and convenient installation. 9.1ch CINEMA Sound is an advanced sound system composed of 9 speakers of different directions and one woofer. These 9 speakers deliver 9 different sounds from each direction, delivering precise and genuine sounds that would make you feel as if you were there. Aramid Fiber cone speakers which are highly resistant to the external stimulus and applied to the unit to minimize sound distortion and deliver clear and precise sound. LG Smart TV – Experience a multitude of popular streaming entertainment and apps with LG Smart TV functions. A full range of quality lifestyle applications, interactive games, and VOD services designed for individual and family entertainment is all yours to enjoy. With Built-in Wi-Fi Enjoy the freedom of a wireless world! Any file in your PC, including movies, photos and music, can be shared wirelessly with the LG Blu-ray ™ Home Theater system, free from complicated hardwire connections. Enjoy the contents as if they were originally embedded in your TV. Miracast – Miracast™ allows screen mirroring from mobile devices to TV through LG Blu-ray™ Player. Just mirror the screen of mobile devices and enjoy mobile contents -pictures, videos, games- right on the TV screen.